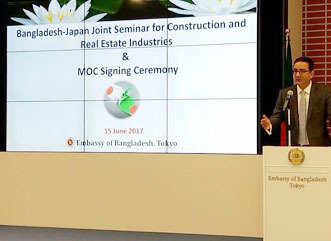 To build on strong bilateral relationship for developing and upgrading domestic public infrastructure assets with the purpose of supporting the growing economy of Bangladesh in a sustainable manner, Public Private Partnership (PPP) Authority has signed a Memorandum of Cooperation (MoC) with the Ministry of Land, Infrastructure, Transport and Tourism (MLIT), Japan through a grand ceremony held at Embassy of Bangladesh, Tokyo on 15 June 2017. 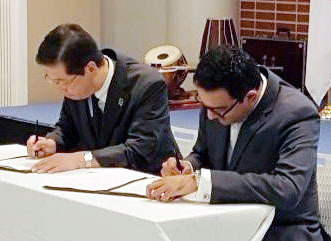 Syed Afsor H. Uddin, Chief Executive Officer (CEO), PPP Authority, Prime Minister’s Office signed the MoC on behalf of the Bangladesh Government while Yasuki Kaibori, Deputy Minister for Construction, Engineering and Real Estate Industry, Minister’s Secretariat, Minister of Land, Infrastructure, Transport and Tourism signed the MoC on behalf of Japan Government. It is expected that the signing of the MoC for the G2G arrangement for PPP projects with Japan government will be a significant milestone for implementing PPP Projects under this framework. 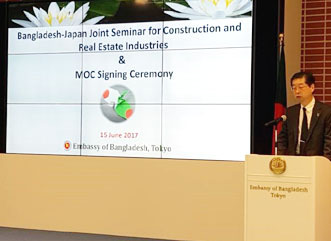 A seminar titled ‘Bangladesh-Japan Joint Seminar for Construction and Real Estate Industries’ was held before the signing ceremony. A large number of high officials from the public sector and investors from the private sector were also present in the occasion. Syed Afsor H. Uddin, CEO of PPP Authority welcomed everyone in his speech and presented an overview of G2G Partnership Policy published by the Bangladesh Government. He mentioned that PPP Authority, on the instructions of the Board of Governors chaired by the honorable Prime Minister, proposed the “Policy for Implementing PPP Projects through Government to Government (G2G) Partnership, 2017” (the G2G Policy) which has been approved by the honorable Prime Minister as the Chairperson of the Board of Governors for PPP Authority and subsequently it has been gazzeted on 8 June 2017. While developing the draft policy, preliminary discussions and consultations have been held with government agencies for receiving feedback on the outlook and framework of the suggested arrangements as laid out in the draft document. The government of Japan expressed its keen interest in the Bangladesh PPP program and showed early interest in working closely with the Bangladesh Government in a G2G Partnership basis. 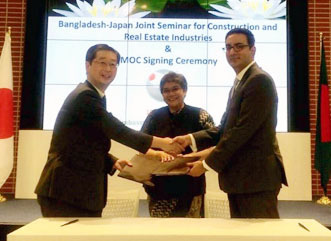 Syed stated that in line with the G2G Policy, the Government of Bangladesh via Prime Minister’s Office through Economic Relations Division (ERD), Ministry of Finance requested Ministry of Land, Infrastructure, Transport and Tourism (MLIT), Government of Japan to sign the Memorandum of Cooperation (MoC). Subsequently, MLIT confirmed to sign the first PPP G2G Memorandum of Cooperation (MoC) with the PPP Authority as per Section 6 of the G2G Policy. Yasuki Kaibori, Deputy Minister for Construction, Engineering and Real Estate Industry, Minister’s Secretariat, Minister of Land, Infrastructure, Transport and Tourism thanked PPP Authority for taking initiatives in carrying out discussions and visits that took place between MLIT, PPP Authority, Prime Minister’s Office and Japanese Investors to finalize the framework of the cooperation. MLIT also called Bangladesh Government for continued support to Japanese investors in the country in various aspects including security. Bangladesh enjoys strong diplomatic ties with Japan and there is a long history of friendship. There is an extensive bilateral program in place for the provision of Japanese financial and technical support. Japan also has extensive experience of promoting and implementing successful PPP projects especially on complex civil engineering issues. Interest from Japan on Bangladesh’s proposed G2G PPP Program provides strong reassurance of the interest in the concept demonstrating the wider interest to support enhanced infrastructure development in Bangladesh.